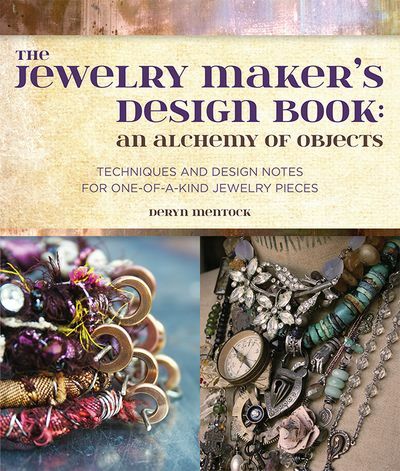 Inspiring is the word you will hear used time and again when people talk about Deryn Mentock's new book, The Jewelry Maker's Design Book. First, I want to tell you what this book is not, so that you don't end up buying it under false impressions: it is not a book with projects that you'll be able to easily duplicate exactly. It's very unlikely that you'll be able to (or even necessarily want to) find exact replicas of all the objects Deryn uses. You may find that frustrating, especially if you're a beginner to mixed media and found object jewelry, but that's just the facts. If you don't care for Deryn's preference for religious imagery, you won't want to use the same objects in any case. There, you've been warned. Now I can tell you all the great things that this book is! 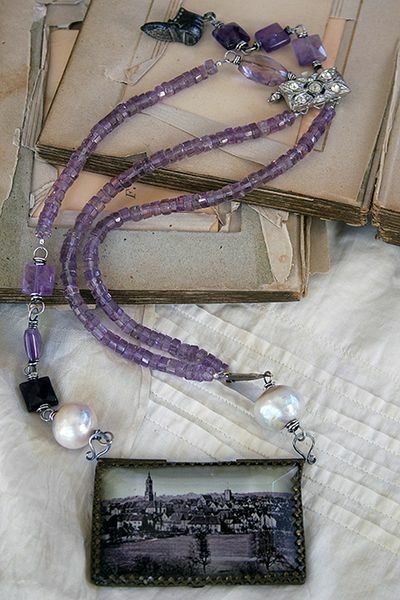 It is an extension of Deryn's journal, a closer look at what she does and how she does it, the creative process that she follows to make her beautiful found object pieces. If you are a fan of the look of Deryn's work, you're going to love love love this book. There's a lot to be learned her, especially through the journal notes and tips that she includes with each project. If you're familiar with Quarry Books, the publisher, you already know about the beautiful photography and high quality of their books. One of the major issues with found object jewelry is how the heck to hook everything together once you've decided where it all goes. Just reading through the projects with an open mind will have you saying, "Well, of course!! Duh!!" That's the real beauty of it...all the pieces are so well thought out and beautifully constructed. Everyone has read about the elements and principles of design, but Deryn tells you how they actually relate to jewelry making. 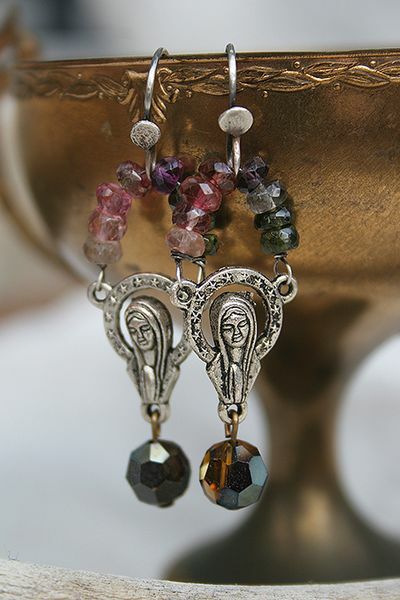 Her advice in this area applies to more than just mixed media or found object jewelry, as does her insistence on practicing technique to achieve perfect workmanship in your pieces. So true...nothing can spoil the look of a found object piece more quickly than sloppy attachments. Many basic techniques are covered before the project section begins, so never fear if you are new to all of this. So, I will close with this: if you like the look of Deryn's work and are able to keep an open mind about what objects YOU would choose to work with, I think you will really value and learn from this book.